If you’ve ever used a jet or pressure washer before, you’ll know the sense of satisfaction after you’ve blasted away years’ worth of accumulated dirt and debris. Whether you’re cleaning your driveway or want to make your car’s exterior shine, the exertion of water at a high rate of pressure is a sure-fire way to achieve the best possible results. At SGS, we sell a wide range of jet washers and portable pressure washers from brands such as Honda and Hyundai. We have petrol and diesel pressure washers that are ideal for domestic use and others that can work in an industrial setting. Either way, you’re sure to find what you need on our website, regardless of how much dirt you’re hoping to wash away. At SGS, we recognise the importance of buying the right pressure washer to suit your circumstances. To this end, we’ve created a range of options, from electric pressure washers to those that are powered by petrol and diesel. Our range also includes portable pressure washers and products that have been efficiently designed to clean specific items. A Hyundai pressure washer offers you the promise of power, durability and ease-of-use, so check out the Hyundai 3100 power washer to see if it could be right for you. 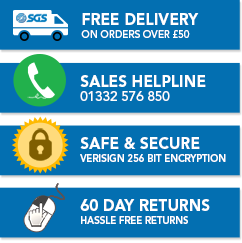 When shopping with SGS, you can even buy a brand-new jet or power washer online today and qualify for free next day delivery within the UK. This represents a big saving, and one that really offers value for your hard-earned cash. Not sure where to start? Let our team help you out! While we all know that a pressure washer can leave your cars and driveways sparkling clean, it can be hard to find the right tool to suit a particular task. So, while the SGS range offers tremendous choice and value for money, it can be hard to make an informed choice if you’ve never purchased a pressure washer before. You needn’t worry though, as our friendly and knowledgeable team of technicians have got you covered. Whether you’re starting from scratch or are simply unsure about the power capacity that you need, give us a call today and we will help you to select the most suitable pressure washer. Buying the right tool for a job is crucial for all outdoor tasks, and pressure washing is no exception to this rule. Regardless of the outdoor task that you have in mind, you may need some guidance from time to time if you’re to achieve the best possible results. To help with this, we’ve created several how-to and buying guides that answer a range of your most frequently asked questions. Have you ever struggled to start up your chainsaw? If so, this handy guide will provide you with the information that you need. Some tools are more multi-functional than others, with the trusted garden strimmer capable of completing several different jobs. Read on to find out more. Whether starting a gardening business or starting from scratch, this guide identifies the tools that you’ll need to maintain the great outdoors.